A new agreement means Misissauga-based Swallow Acoustic Consultants Limited (SACL) will be acquired by engineering firm Thornton Tomasetti. SACL specializes in noise and vibration assessment and control, and also offers expert witness testimony and technical writing services. An AIA jury commended the Albion District Library in Toronto for its integration of design and cutting-edge performance. 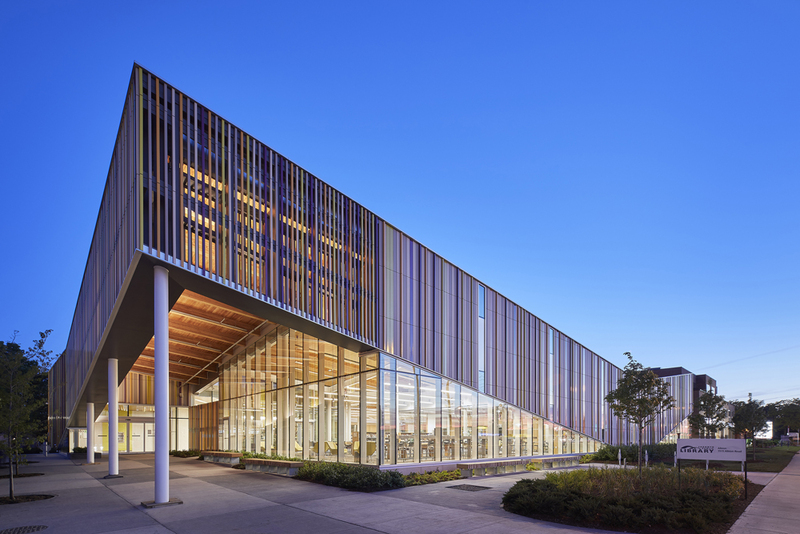 The Albion District Library in Toronto has won Perkins+Will a spot in the American Institute of Architects (AIA) Committee on the Environment (COTE) Top Ten Awards. Located in the Rexdale neighbourhood at the northwest edge of the city, the 2694-m2 (29,000-sf) library is a critical social resource for a diverse, high-needs community. According to AIA, plans to renovate/expand the existing branch were abandoned in favour of a new build on the adjacent parking lot to facilitate uninterrupted service at the library. The community’s desire for a safe urban oasis inspired the concept of a walled garden defined at its perimeter by a polychrome screen of terracotta louvers. The textured façade lifts at the corners articulating the entry and key program areas. An undulating timber roof slopes to three courtyards bringing light, colour, and nature into the heart of the square plan. The cost of construction, excluding furnishing, was $11.8 million. The existing library site was also converted into a multiuse urban plaza to support community markets and events. “This project has a predicted energy use reduction of 40 per cent over the national average for this building type and climate while providing thermally comfortable, well daylit, and joyful spaces for the occupants. This library is a praiseworthy example of design excellence,” said the jury in its statement. COTE bestows the award annually on 10 design projects that have expertly integrated design excellence with cutting-edge performance in several key areas. To be eligible, project submissions are required to demonstrate alignment with COTE’s rigorous criteria for 10 measures including social, economic, and ecological values. Award recipients will be honored in June at the AIA’s Conference on Architecture in New York City. For more information on the awards, click here.